“If chess were being invented today, it would never get past the test stage,” my brother said at Christmas, in one of those comedy riffs of his that could be original or borrowed from the classics and I’ll never know. “They’d say what is this, it’s got too many different player characters and only one map and the most important piece has no moves and the most powerful piece overwhelms the others and you can even have endings where no one wins.” That’s true; I realize that a lot of the strategy is deciding when to and how to use the queen. And the symmetry/asymmetry of the game is so much of its appeal; somehow it is perfectly balanced through being a tiny bit unbalanced and vice versa. The International Board Game Studies Association which begins tomorrow at UCS. Years of occasional Carcassonne, Settlers, and Yankee Swap still haven’t prepared me to know what this conference is going to look like. 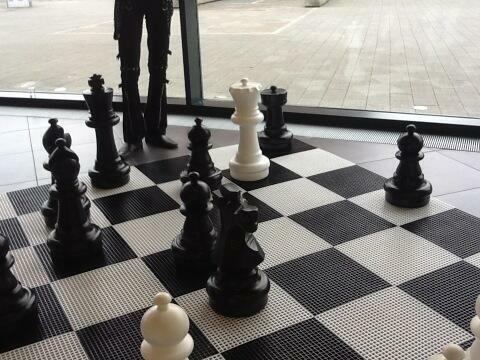 Except I hear there’s going to be a giant chess set. This entry was posted on 19 May 2014 at 9:50 pm and is filed under Uncategorized. You can follow any responses to this entry through the RSS 2.0 feed. Both comments and pings are currently closed.